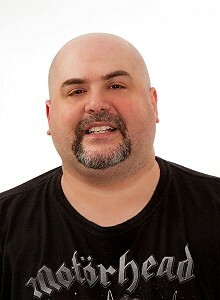 Writer and film critic L L Soares is a former co-chair of the New England Horror Writers (NEHW) and is an active member of the Horror Writers Association (HWA). Not really, although it's always great to meet people who have read your work and who enjoyed it. I guess the one effect I can think of is that it definitely inspires you to keep writing. It's cool when people you know like your stuff, but that first time a complete stranger comes up to you and tells you that they're a fan, or they look forward to a new book by you, that's an amazing feeling. I am especially fond of the early- and mid-career books by J.G. Ballard, before he delved into more mainstream work. I'm talking about his novels like The Crystal World, High-Rise, Concrete Island, and, of course, his masterpiece, Crash. If any novel is a touchstone that I return to every once in a while, it's Crash. 1950s pin-up era Bettie Page or 1920s film star Louise Brooks. My Kindle (with my favorite books on it), my IPod (with my favorite music). Stolichnaya vodka, Jack Daniels whiskey, and Bass Ale. And of course my laptop, so I can keep writing. I think all writers want to leave a lasting impression, and have some kind of legacy that lasts when they're gone. At this point, just to get more people to read my books. I want to get as many readers as I possibly can. Writing is a kind of communication with the outside world, so you obviously want to reach as many people as possible. I think a good book can touch a person's life, and I hope I write good books. I write the kinds of books I would want to read, but which aren't out there in the world. If I can write something that works on a universal level, but that also speaks to someone on a personal level, then it's a success. Born: Born in New Bedford, Massachusetts (U.S.) on October 29th. Just two days before Halloween. And I have been writing the movie review column "Cinema Knife Fight" with Michael Arruda for over a decade. It was nominated for a Bram Stoker Award in 2009, but did not win. It currently has a whole website created around it, with a full staff of badass writers. The usual places: Facebook, Twitter, etc.